Hypoglycemia has been documented during regular hemodialysis (HD) in both diabetic and nondiabetic end-stage renal disease (ESRD) patients. The aim of this study was to evaluate the glycemic fluctuations in diabetic and nondiabetic ESRD patients during HD days using glucose-free and glucose-containing dialysate. We conducted a prospective interventional study in which 32 ESRD patients (16 diabetic and 16 nondiabetic) were included in the study. All the patients underwent two HD sessions with glucose-free bicarbonate solution (phase 1) and next two HD sessions done with 100 mg/dL glucose-containing dialysate (phase 2). Serum glucose was measured using a continuous glucose monitoring system at the 1st h, 2nd h, and 4th h in both the phases. Percentage of time above and below preset target range (70–140 mg/dL) in 24 h on HD days in both phases was noted. Glucose loss in effluent fluid from dialyzer also was estimated at the 1st h, 2nd h, and 4th h. Statistical analysis was performed using Statistical Package for the Social Sciences software. Data are expressed as mean ± standard deviation. The Chi-square test was used for comparison of categorical variables. Continuous variables were compared using Student’s t-test. Value of P <0.05 was considered statistically significant. With glucose-free dialysate solution, 20 patients (diabetic - 15, nondiabetic - 5) had 22 episodes of hypoglycemia in 64 sessions and with glucose-containing solution, only five patients (diabetic - 4, nondiabetic - 1) had five episodes of hypoglycemia (P = 0.002). For all patients, glucose lost (g/h) in the effluent fluid was at lower values in phase 2 (5.91 ± 1.5) when compared to phase 1 (7.08 ± 10.9) (P <0.0002). This was also observed both among the diabetic and nondiabetic patients. The mean percentage of time below target out of 24 h on HD days in phase 1 was significantly higher as against phase 2 (33% vs. 18.7%; P = 0.0001) which was observed both among diabetic group (18.65% vs. 13.5%; P = 0.03) and nondiabetic group (48.12 % vs. 23.4%; P = 0.0003); the mean percentage of time above the target (>140 mg/dL) out of 24 h on HD days was significantly higher than phase 2 (21.1% vs. 9.3%; P = 0.0001). This was also observed among diabetics group of patients (18.8% vs. 8.6 %; P = 0.0001). Most of this time above target occurred during the post HD period. However, in the nondiabetic group, there was no significant difference between the two phases. Glucose-containing dialysate at 100 mg/dL significantly reduced the hypoglycemic episodes and also the intensity of hypoglycemia. Diabetic patients dialyzed with glucose-free dialysate had increased time above target (akin to Somogyi effect) in the post HD period compared to same patients dialyzed with glucose-containing dialysate. Hence, glucose-containing dialysate appears to offer better glycemic control and lesser glycemic fluctuations during HD days for both diabetic and nondiabetic ESRD patients. Type 2 diabetes mellitus (is one of the leading causes of chronic kidney disease and end-stage renal disease (ESRD). Diabetes mellitus (DM) patients can experience hyperglycemia, hypoglycemia, and glucose variability during hemodialysis (HD). Cardiovascular disease is worsened by all these three components of DM., Hypoglycemia has been reported more frequently in diabetic ESRD patients during HD sessions, but most of them are asymptomatic.,,,,, Among nondiabetic ESRD patients, asymptomatic hypoglycemic episodes during HD has also been documented.,,,, Continuous glucose monitoring system (CGMS) helps us to detect not only these asymptomatic hypoglycemic episodes during HD sessions but also glycemic fluctuations occurring as a sequel of HD. We assessed the effect of HD sessions on glycemia (estimated by timed post dialysis venous sampling and CGMS) in both diabetic and nondiabetic patients using glucose-free and glucose-containing dialysis solutions. We aimed to evaluate the incidence of hypoglycemic episodes, glucose loss in the dialysate and its correlation with hypoglycemic episodes and post dialysis glycemic status on HD days. We conducted a prospective interventional trial over a period of eight months (April 2015 to November 2015). Out of 52, ESRD undergoing HD treatment at our unit, 38 patients (19 in diabetic group and 19 nondiabetic group) were included after obtaining written consent. Patients with minimum 18 years of age who are stable while on HD and who have been on regular dialytic therapy for at least previous 30 days were included in the study. Excluded were the unstable patients with ongoing systemic infection, patients hospitalized for comorbid illness, and unwilling patients. In phase 1, all the patients in the study (diabetic and nondiabetic) underwent two sessions of regular 4-h HD with glucose-free bicarbonate dialysate. In phase 2, they were dialyzed using a specially prepared glucose added solution (100 mg/dL in the final dialytic fluid) provided by the same manufacturer for another two sittings. Fresenius 4008S equipment and polysulfone Fresenius F6 dialyzers were used for the study. Dialyzers were reprocessed and reused as per the standard guidelines. All patients underwent glucose monitoring using Freestyle LibrePro (Abbott) CGMS. This monitor works on the principle of glucose oxidase-based electrochemical sensor which is capable of measuring interstitial glucose level once in every 15 min for 14 days continuously. The sensor was placed subcutaneously in the nonAVF upper arm just before starting HD in phase 1 and kept secured in position for next 14 days till the end of phase 2 of our study. Data were downloaded and stored in computer and depicted as graphs. Percentages of time above and below preset target range out of 24- h of HD days in phase 1 and phase 2 were noted. During each HD session, blood glucose level was measured at 1st h, 2nd h, and at the 4th h (at the end of the session). Samples were collected from the arterial line of the dialysis system, just before entering the dialysis circuit. Glucose level of the effluent fluid was also measured simultaneously (i.e., at 1st h, 2nd h, and at the 4th h) in all the patients. The effluent fluid was collected directly at the point of exit from the dialyzer during the HD session. Glucose level in the plasma and dialytic fluid were measured by enzymatic method in a spectrophotometer. In phase 2, the basal content of the dialytic fluid was deducted from the total glucose value of the effluent measured. Among the 18 diabetic patients enrolled, 16 were on short-acting insulin therapy as per standard protocol. Neither the insulin treatment nor the dietary habits were changed during the study period. The patients were allowed to have snacks during the dialysis. They were carefully monitored for signs or symptoms of hypoglycemia throughout the period of HD sessions. Whenever hypoglycemia was suspected, it was confirmed by capillary glucose estimation and the patient was treated with 100 mL of 25% dextrose in the peripheral vein. Target glycemic range was defined as blood glucose between 70 and 140 mg/dL; Hypoglycemia as a glucose level of <70 mg/dL and hyperglycemia as a glucose level of >140 mg/dL. Statistical analysis was performed using Statistical Package for the Social Sciences software version 24.0. Data are expressed as mean ± standard deviation. The Chi-square test was used for comparison of categorical variables. Continuous variables were compared using Student’s t-test. P <0.05 was considered statistically significant. Institutional Ethical Committee approval was obtained for the study. A total of 38 patients were included in the study. Two patients from diabetic group and two from nondiabetic group had faulty CGMS reading. One diabetic patient lost follow-up and one nondiabetic patient was irregular with the dialysis schedule. Data of remaining 32 patients (diabetic – 16 and nondiabetic - 16) and their 128 HD sessions (64 sessions in each phase) were analyzed. There was no significant difference observed between diabetic and nondiabetic group with respect to clinical and biological characteristics [Table 1]. Table 1: Clinical and biochemical characteristics of study population. Out of 128 HD sessions, four episodes of hypoglycemia (3%) had clinical symptoms and signs during HD sessions. This symptomatic hypoglycemia occurred in four (diabetic - 3; nondiabetic - 1) out of 32 patients. All these patients had symptoms only when they were dialyzed with glucose-free dialysate. Twenty (diabetic -15; nondiabetic - 5) out of 32 patients (62%) had hypoglycemia during phase 1 against five (diabetic - 4; nondiabetic - 1) out of 32 patients (15.6%) during phase 2 (P = 0.022). Hypoglycemic episodes were also significantly higher in phase 1 than phase 2 [phase 1 - 22/64 (34%) (diabetic - 17; nondiabetic - 5); phase 2 - 5/64 (7.8%) (diabetic - 4; nondiabetic - 1); P = 0.036]. The lowest values of blood sugar were 46 mg/dL and 64 mg/dL in phase 1 (among diabetic and nondiabetic, respectively) and 64 mg/dL in phase 2 (among both diabetic DM and nondiabetic). There is no significant difference in incidence of hypoglycemic episodes between the 1st, 2nd, and 4th h [Table 2]. Table 2: Hypoglycemic episodes and number of patients with hypoglycemia in venous blood sugar monitoring. By CGMS, the mean percentage of time below target on the day of HD in phase 1 was significantly higher as against phase 2 (33% vs. 18.7%; P = 0.0001). This was also observed both among diabetic group (18.65% vs. 13.5%; P = 0.03) and nondiabetic group (48.12 % vs. 23.4 %; P = 0.0003) [Figure 1]. When analysing the number of hypoglycemic episodes using CGMS, out of 64 HD sessions in phase 1, 50 sessions (diabetic - 23; nondiabetic - 27) (78%) had hypoglycemia during HD as compared to 13 sessions (diabetic - 11; nondiabetic - 2) out of 64 sessions (20%) in phase 2. Figure 1: CGMS tracing of glycemic fluctuation in a 54 years DM patient undergoing hemodialysis. Top panel is the 24 h tracing on the day of H.D with glucose-free dialysate (phase 1) and bottom panel on the day of H.D with glucose-containing dialysate (phase 2). During phase 1, there is a greater fluctuation of glycemia as evidenced by time in target of 58% and time below and above target of 21% each. Time above target occurred predominantly during post hemodialysis period. In phase 2, the glycemic fluctuation was minimal and time in target was 85% and time below and above target were 1% and 14%, respectively. The mean percentage of time above the target on the day of HD in phase 1 was also significantly higher than phase 2 (21.1% vs. 9.3%; P = 0.0001). This was also observed among diabetic group of patients (18.8% vs. 8.6 %; P = 0.0001). Most of this time above target occurred during post HD period. However, in nondiabetic group, there was no significant difference in duration of hyperglycemia on dialysis days in phase 1 and phase 2 [Figure 1]. It was observed that the loss of glucose (g/h) in the effluent fluid from the dialyzer was significantly higher in phase 1 (7.08 ± 1.92) than in phase 2 (5.91 ± 1.5) (P = 0.0002), after deducting the basal glucose level of dialysate glucose in phase 2. This was observed both among the DM (7.17 ± 2.07 vs. 5.6±1.62; P = 0.0015) and the NDM patients (6.99 ± 1.74 vs 6.12 ± 1.5; P = 0.038) [Figure 2]. Figure 2: Glucose loss in the effluent (mg/h) (P < 0.05). There was no correlation between the hypoglycemic episodes and the severity of glucose loss in the effluent fluid. In early days of HD, very high concentration of glucose was added to the dialysate to favor ultrafiltration (glucose acting as osmotic agent) and to reduce nutritional loss during HD. With the advent of hydrostatic pressure mediated ultrafiltration, glucose concentration of dialysate fluid was markedly reduced. Most of the centers preferred glucose free dialysate to reduce bacterial and fungal infections and to reduce the cost. This is being continued in most of the centers in our region at the cost of increased incidence of asymptomatic hypoglycemia during HD sessions. We defined hypoglycemia as blood sugar <70 mg/dL because studies showed that at this level, deterioration of the auditory evoked potential occurs and there are initial physiological changes of the α and β cells of the pancreas. In this study, 22 hypoglycemic episodes occurred out of 64 sessions (34%) in phase 1 when compared to five episodes of hypoglycemia out of 64 HD sessions in phase 2 (7.8%) when monitored by timed venous glucose measurement. By CGMS, out of 64 HD sessions in phase 1, 50 sessions (78%) had hypoglycemia during HD as compared to 13 sessions out of 64 sessions (20%) in phase 2. However, only four symptomatic hypoglycemic episodes occurred out of 128 HD sessions during both the phases. In concordance with previous studies, we also observed that, most of the hypoglycemic episodes occurring during HD were asymptomatic. This could be postulated to be due to the blunting effect of neurohumoral response caused by frequent repetition of hypoglycemic episodes during HD., Studies show that maintenance of low glycemic levels for a prolonged period increases glucose uptake by the brain cell which would also explain the asymptomatic nature of these hypoglycemic episodes. These asymptomatic repetitive hypoglycemic episodes in long run may lead on to the risk of progressively compromised cognitive function, especially among DM patients., Hence, glucose added dialysate reduces hypoglycemic episodes in short term and prevent cognition impairment in long term. 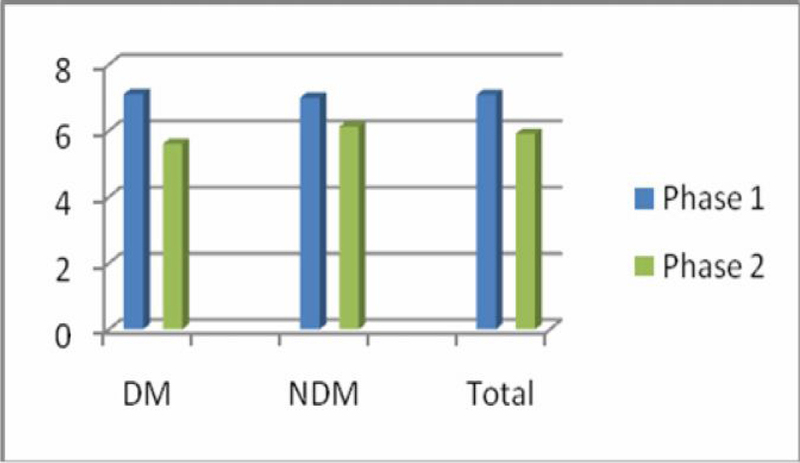 In this study, the lowest blood glucose was 46 mg/dL in DM and 64 mg/dL in NDM patients during phase 1 and 64 mg/dL in both DM and NDM patients during phase 2. This shows that DM patients possibly have higher risk of developing more intense hypoglycemic episodes. The probable cause for this intense hypoglycemia may be the altered metabolic, nutritional, hormonal, and therapeutic response among the diabetic patients. Previous studies showed that hypoglycemic episodes during HD also occurred when dialytic fluid with glucose at 100 mg/dL was used and was more frequent than when dialyzed using dialysate of 200 mg/dl glucose. In our study also, patients (20% in CGMS and 7.8% by venous sampling method) developed hypoglycemia when dialyzed with glucose of 100 mg/dL containing dialysate. This shows the significance of using glucose containing dialytic solution during HD. However, the definition of ideal glucose concentration in the dialysate requires further research. In our study, there was a significant loss of glucose (g/h) in the effluent fluid during phase 1 (7.08 g/h) as compared to phase 2 (5.9 g/h). However, there was no correlation with hypoglycemic episode and timed glucose loss in the effluent in our study. This shows that there may be some other cause for these frequent hypoglycemic episodes apart from the loss of glucose in the effluent fluid. Literature also supports this notion by saying that, HD improves the insulin resistance by correcting chronic uremia, thereby enhancing glucose uptake by muscles. There would, also, be increased diffusion of glucose into the erythrocytes. HD alters the pH of the cytoplasm of erythrocytes resulting in accelerated anaerobic metabolism and increased glucose consumption. Hence, the use of glucose-free dialysate is associated with greater risk of hypoglycemia. In this study, average percentage of time above the target traced among diabetic patients in phase 1 (18.8%) was significantly higher than diabetic group in phase 2 (8.5%). It was observed that the time above target occurred predominantly during post HD period. No significant difference was seen in nondiabetic group between the two phases. This observation showed that diabetic patients dialysed with glucose free dialysate will have higher post HD blood sugar on that particular day when compared to those dialysed with glucose-containing dialysate. Studies also show that there may be increase in blood sugar post HD naming the phenomenon as “HD induced hyperglycemia”. Reasons postulated are secretion of counter regulatory hormones in response to hypoglycemia occurring during HD akin to that of Somogyi phenomenon, loss of insulin during HD which is more with polysulfone dialyzer and insulin resistance as a part of azotemia in ESRD patients. Hence, patients dialyzed using glucose-containing dialysate may have a better control of glycemic status not only during dialysis session (reduced hypoglycemia) but also in the post HD period of the HD day (reduced hyperglycemia), thereby reducing overall adverse effects of diabetes. It is a known fact that greater degree of glycemic variability increases the overall mortality rate. Limitations in our study are namely limited size of the study group, dialyzer reuse varied among patients and different schedule of dialysis in relation to the time of insulin administration. Hypoglycemic episodes were higher in patients dialyzed with glucose free dialysate when compared to glucose (100 mg/dL) containing dialysate. Most of the hypoglycemic episodes were asymptomatic. Glucose loss in the effluent dialysate was higher during HD using glucose-free dialysate as against glucose-containing dialysate. Diabetic patients dialyzed with glucose-free dialysate had increased time above target in the post dialysis period on HD days as compared to the same patients dialysed with glucose-containing dialysate. We suggest that glucose-containing dialysate appears to offer better glycemic control and lesser glycemic fluctuations during HD days, thereby reducing overall adverse effect in ESRD patients on hemodialysis in short term and in long run. Ideal glucose concentrate in the dialysate requires to be defined by further studies in future. American Diabetes Association. Intense Blood Glucose Control Yields no Significant Effect on CVD Reduction in VA Diabetes Trial; 2008. Available from: http://www.diabetes.org/for-media/pr-intense-bloodglucose-control-yields-no-significant-effecton-cvd-reduction.jsp. Last accessed on 14 August 2017. Loipl J, Schmekal B, Biesenbach G. Long-term impact of chronic hemodialysis on glycemic control and serum lipids in insulin-treated type 2-diabetic patients. Ren Fail 2005; 27:305-8. Jackson MA, Holland MR, Nicholas J, et al. Occult hypoglycemia caused by hemodialysis. Clin Nephrol 1999;51:242-7. Jackson MA, Holland MR, Nicholas J, Lodwick R, Forster D, Macdonald IA. Hemodialysis-induced hypoglycemia in diabetic patients. Clin Nephrol 2000;54:30-4. Akmal M. Hemodialysis in diabetic patients. Am J Kidney Dis 2001;38:S195-9. Simic-Ogrizovic S, Backus G, Mayer A, Vienken J, Djukanovic L, Kleophas W. The influence of different glucose concentrations in haemodialysis solutions on metabolism and blood pressure stability in diabetic patients. Int J Artif Organs 2001;24:863-9. Takahashi A, Kubota T, Shibahara N, et al. The mechanism of hypoglycemia caused by hemodialysis. Clin Nephrol 2004;62:362-8. Kazempour-Ardebili S, Lecamwasam VL, Dassanyake T, et al. Assessing glycemic control in maintenance hemodialysis patients with type 2 diabetes. Diabetes Care 2009;32: 1137-42. Parsaw F, Stewart W. The composition of dialysis fluid. In: Drucker WM, Parsons FM, Maher JF, editors. Replacement of Renal Function by Dialysis – A Textbook of Dialysis. Boston, MA: Martinus Nijhoff; 1983. p. 148-70. Burmeister JE, Scapini A, da Rosa Miltersteiner D, da Costa MG, Campos BM. Glucose-added dialysis fluid prevents asymptomatic hypoglycaemia in regular haemodialysis. Nephrol Dial Transplant 2007;22:1184-9. De Feo P, Gallai V, Mazzotta G, et al. Modest decrements in plasma glucose concentration cause early impairment in cognitive function and later activation of glucose counterregulation in the absence of hypoglycemic symptoms in normal man. J Clin Invest 1988; 82:436-44. Heller SR, Cryer PE. Reduced neuroendocrine and symptomatic responses to subsequent hypoglycemia after 1 episode of hypoglycemia in nondiabetic humans. Diabetes 1991;40:223-6. McCall AL, Fixman LB, Fleming N, Tornheim K, Chick W, Ruderman NB. Chronic hypoglycemia increases brain glucose transport. Am J Physiol 1986;251:E442-7. Heller SR, Macdonald IA. The measurement of cognitive function during acute hypoglycaemia: Experimental limitations and their effect on the study of hypoglycaemia unawareness. Diabet Med 1996;13:607-15. Abe M, Kalantar-Zadeh K. Haemodialysis-induced hypoglycaemia and glycaemic disarrays. Nat Rev Nephrol 2015;11:302-13.